Flag Your Way to Successful Revisions - Write Nonfiction NOW! Self-editing your manuscript can feel overwhelming. There are many things you could change or need to change in the revision process. How will you remember them all—or catch all the potential errors? Today, professional editor Helga Schier (@withpenandpaper) provides a strategy for keeping your focus on specific issues during each round of revision. No doubt you know that the last period on your first draft is not the end but the beginning of your writing journey. First drafts are diamonds in the rough, dull stones that need to be cut, shaped, and polished in the revision process. For many among you, though, revision is a daunting task. It doesn’t have to be. All you need is an open mind and lots of post-it notes. No doubt you’ve heard that the first thing you should do once you finished your first draft is nothing. Take a break. Don’t start the revision process immediately. Many writers start tinkering with their work too early, before they’ve gained some critical distance. However, just taking a break won’t get you ready either. You need to take an active break. By that I mean, while you’re not writing or revising your own work, read other people’s work. Read critically and analytically, which is to say, take notes. The first thing you should do once you finished your first draft is nothing. Which phrases did you like? Did you find an image that spoke to you? When did you keep reading although you were supposed to pick up your kids? Get out your post-it notes and flag those sections. Once you’ve read the whole book, go back and analyze what the writer did to evoke your reaction in that sentence, paragraph, page, or chapter. First drafts are diamonds in the rough, dull stones that need to be cut, shaped, and polished. Once you’ve read other people’s work, read your own—not like a writer who edits, but like a reader who wants to be moved. Find the sections that make you laugh, cry, think… the places that make you forget you were the one who wrote this. In short, instead of looking for what doesn’t work, look for what works. Those are the sections you should be proud of. Flag them. (Green post-it notes, perhaps?) They’ll remind you of why you wrote the book in the first place. They might even get you excited about the revision process. And they will build the foundation for your revisions. As you did with other people’s writing, analyze what you did as a writer to elicit your (positive) reaction as a reader. Bottom line, get a sense of what you do well, so you can capitalize on these strengths throughout the revision process. Once you are aware of your strengths, dig for your weaknesses. The second read-through of your draft should focus on your book’s content. You can talk craft—great first lines, lovely images, pacing—‘til kingdom come. If there is no substance, no kernel of truth, no understanding, no insight to share, your book will fall flat. So, the second read-through of your draft should focus on your book’s content. Did I clearly state my topic? Are scope and sequence of my chapters clearly defined? Do the chapters naturally develop from each other? Are there enough ‘cliffhangers’ between chapters to make readers turn the pages? Does every chapter have a point? Do I get to that point as succinctly as possible? Do I use enough examples to illustrate my point? Do my points lead to the conclusions I’d like to draw? Is it clear what my readers will take away from my manuscript? Does my manuscript deliver what my first chapter promises? In this second read-through, flag issues. Use post-it notes (yellow?) that are big enough for quick commentary: the problem, ideas for solutions, things to research/add/change/cut… Be merciless in flagging sections that are superfluous or repetitive. You do not want to state the obvious. Your third read-through needs to deal with voice and style. No matter how great a point you may have, unless it is made well, nobody will listen. And, therefore, your third read-through needs to deal with voice and style. As a general rule, your voice should operate in the background to serve your subject matter, and yet, it should be distinct. Ironic distance, humor, introspective contemplation, academic scrutiny, honesty, serenity … all these are possible attitudes for your narrative voice (yes, even non-fiction manuscripts have a narrative voice). Decide which voice best suits you, your subject matter, and your audience. Do I address the reader respectfully? Am I (too) direct (enough)? Am I hiding behind clichés, glossing over difficult aspects of my content? Take out more post-it notes (blue?) and flag the sections where you as a reader feel that your voice as a writer obscures what you wish to accomplish. Books touch readers because they entertain, teach, warn, lift up, ease pain or fear, amuse, pass on cultural heritage and knowledge, and bring about change big and small. So go ahead, teach, but don’t lecture. Entertain, but don’t skid the surface. Provide escape, but don’t offer denial. Ease pain and fear, but don’t curb feeling them. Illustrate struggles, but don’t complain. Above all, reveal human flaws, but don’t judge. Instead, invite the reader to join your journey. You’ll recognize when you strike the right balance. Nothing will provide more roadblocks on that journey than a carelessly edited manuscript. Nothing will provide more roadblocks on that journey than a carelessly edited manuscript. Your words are your tools; in your fourth read-through, make sure they are in working order. No need for a clever metaphor in every sentence or for an adjective before every noun. Avoid complicated sentences if a simple one will get your point across. Don’t be verbose—every sentence has a point; get to it. Look for typos, sort out commonly mistaken words such as die/dye or there/their/they’re. Watch your grammar. Make sure your nouns agree with your verbs and the personal pronouns fit. If a paragraph begins in the past tense, it ought to end in the past tense, too. Figure out where those commas go. You ought to have a colorful manuscript now, full of different-color flags marking things that work, others signaling content-related issues, stylistic improvements, or reminders to dot your ‘i’s and cross your ‘t’s. They are your road map, ensuring that you won’t get lost fiddling with details before your concept works. 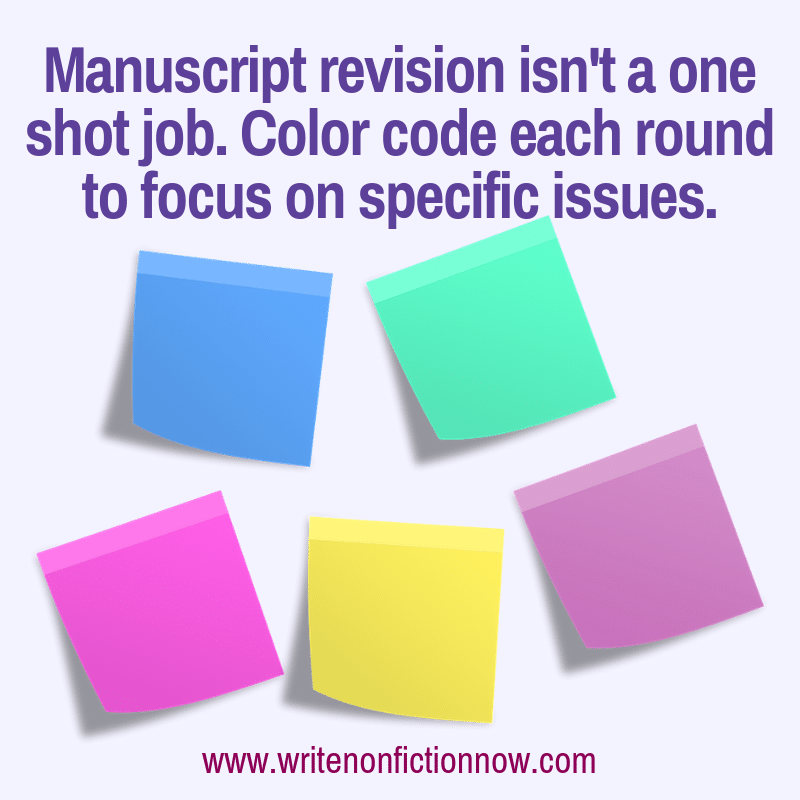 So, start your actual revisions with big-picture issues and slowly work yourself through the rainbow of post-it notes. Repeat this process until you think you cannot improve your manuscript any further. Then contact a professional editor. Trust me, we’ll find more stuff to flag. How do you edit your manuscripts? Tell me in a comment below. 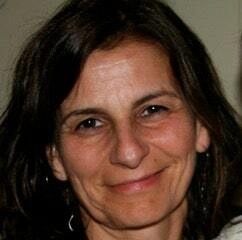 Helga Schier, PhD, has worked in publishing for over 25 years as editor, writer, and translator. After many years as editor and executive editor in Big Five publishing houses, she founded withpenandpaper.com and provides independent editorial services, helping writers to unlock the potential of their manuscripts. Treating each manuscript like a diamond in the rough, she helps writers refine their non-fiction concepts and story ideas. A true writer’s ally, her constructive and effective editorial services guide writers through the development and writing process, encouraging them to produce the best manuscripts possible. Schier works on non-fiction, memoir and fiction and with published, self-published, and not-yet-published writers. As author, Schier primarily writes non-fiction for the educational market, and travel and language-related materials for the general trade market. She also has translated several memoirs, a novel series, and screenplays. Schier holds a PhD and looks back on years of lecturing on the craft of writing. She is a member of GLAWS, the American Society of Journalists and Authors, the American Literary Translators Association, and the Editorial Freelancers Association.